Philo is a native of New Mexico. She began work at the Lodge as a teenager under the careful eye of Phil and Frances. 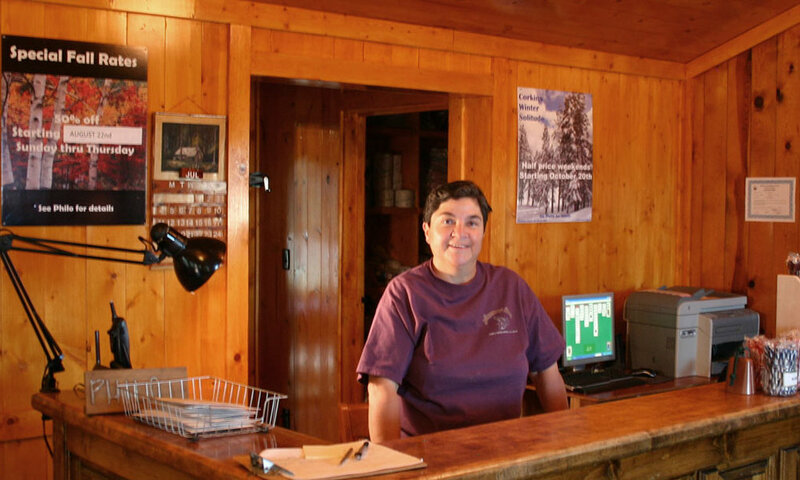 She now runs Corkins with meticulous attention to detail and care honed from decades of experience tending the Lodge and its guests. She’s the friendly voice on the phone handling your booking arrangements when you decide you’d like to spend time here. of the Corkins has been the goal of the current owner, who fell in love with the Southwest in the early 1990’s. The deal was sealed after becoming close friends with Phil and Frances Corkins who, at the time, still maintained residence in a house on the basalt plateau below the Lodge. The Corkins’ vision—clean, neat, cabins; pristine grounds, and a heartfelt welcome to all those who appreciated the grandeur of this place—has been closely followed, while steps have been taken to put in place a long-term vision that includes restoration of the land to its wilderness state, upgrades to the cabins, and improvement of some of the basic amenities, like trails, pool and playground. With so much of the American West parceled up into small tracts, you’re sure to have an added appreciation of the efforts that have gone into creating the uninterrupted landscape you see here today.